The InfraMat™ SmallPad-3T is a specially designed heat therapy pad ideal for targeting small areas of your body. The SmallPad-3T is made with high-quality tourmaline stones to provide you with healing relief. Our New York-based American company HealthyLine™ acquires our stones from the world’s most abundant mines in northern China, puts each one through a rigorous seven-stage quality control process, and then registers them through the proper channels with the FDA, FCC, CE, and several highly respected U.S. laboratories. We take pride in our work and treat our products as works of art, which is why we only use real tourmaline stones, with no colored plastic, to create the InfraMat™ SmallPad-3T. The InfraMat™ SmallPad-3T from HealthyLine™ relieves stress and tension, muscle pain and stiffness, headaches, depression, anxiety and insomnia, and helps lower high blood pressure. Fitted with the purest tourmaline stones in the world and optimized for your health, the InfraMat Pro™ SmallPad-3T is simply the best of its kind. 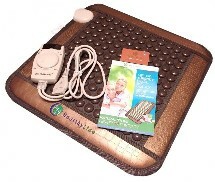 Our high-quality heating pads can be used for health reasons or for pure pleasure. Either way, the quality of our products speak for themselves. So do your body a favor and grab a mat (and maybe one extra for a friend) today!